After installing the Anniversary Update in Windows 10, you might run into various issues such as computer randomly freezes, crashes or the update is incompatible with your antivirus software. In this tutorial we’ll explain how to roll back Windows 10 Anniversary Update by going back to a previous build, without using the install disk. How to Roll Back Windows 10 Anniversary Update? When your computer boots to Windows 10 sign-in screen, click the Power icon at the bottom left. Hold down the SHIFT key and select Restart from the pop-up menu. Choose Troubleshoot > Advanced options, and then click Go back to the previous build. Select the Administrator account you used with your PC. Enter the password for your selected account and click Continue. 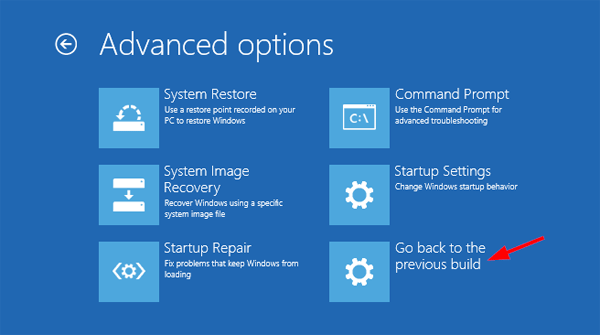 Click Go back to previous build and begin restoring your previous build of Windows 10. Once rolled back you’ll find that Windows 10 Anniversary Update is uninstalled and your computer goes back to what it was before installing the Anniversary Update. Lost your Windows 10 password? How to reset it when you couldn’t get into your computer? If you have a Windows install CD, you can reset your password with a simple trick. But most modern computers come with Windows 10 pre-installed and no install CD is shipped. There is no need to worry! 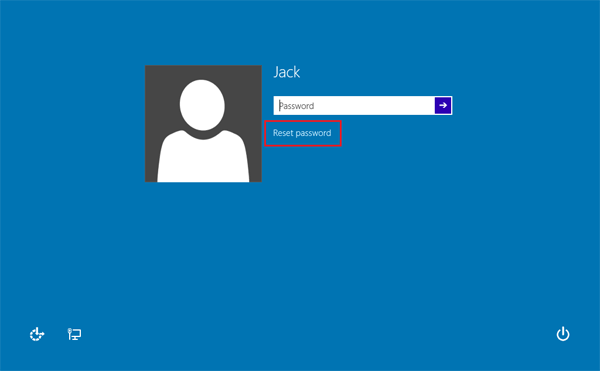 In this tutorial we’ll show you how to reset your Windows 10 password with Hiren’s BootCD. 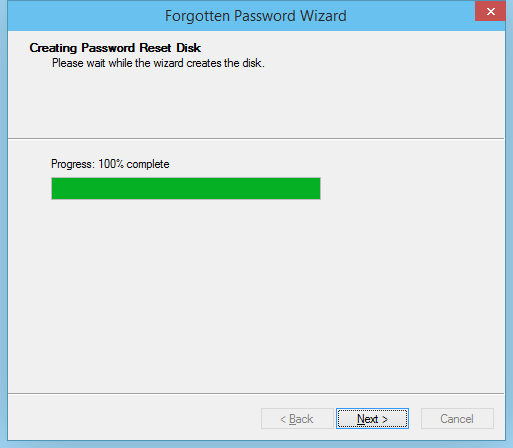 How to Reset Lost Windows 10 Password Without an Install CD? If you don’t have a Hiren’s BootCD, you need to create it using another computer. Download Hiren’s BootCD from its official website and save it to your desktop for extracting. Then burn the ISO image of Hiren’s BootCD to a disc using your preferred burning software. If you don’t have an empty CD laying around, you can create a boot USB drive using the freeware ISO2Disc. Place Hiren’s BootCD into the computer your need to get admin access to. Make sure that CD-ROM is selected as first boot device inside your BIOS. You will see Hiren’s BootCD Menu on your screen, use the arrow keys to move into the “Offline NT/2000/XP/Vista/7 Password Changer” option and then press Enter. When the screen stops at the boot prompt, press Enter again. This step will ask for the partition where Windows is installed. You should be able to identify your system drive with the partition size. Now you have to choose the path to your registry. The default is fine, so hit Enter. Select “Password reset [sam system security]” and press Enter. Choose “Edit user data and passwords” and press Enter. Type the user name you want to reset the password and press Enter. To blank the password, select “Clear (blank) user password” and press Enter. Type ! and then type q to quit. Next type y to save your changes. Edit Complete!, all done, when it asks for new run type n and press Enter. Reboot your computer. 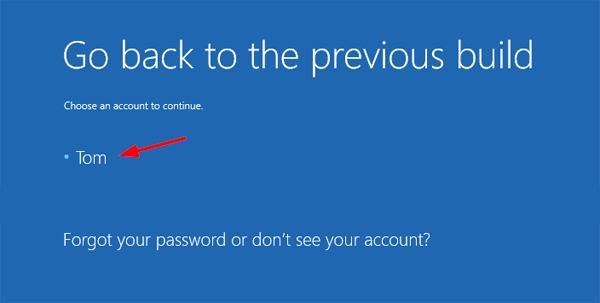 You should be able to log into your Windows 10 user account without password! Starting from Windows 7, burning a CD becomes more convenient and easier than ever before. 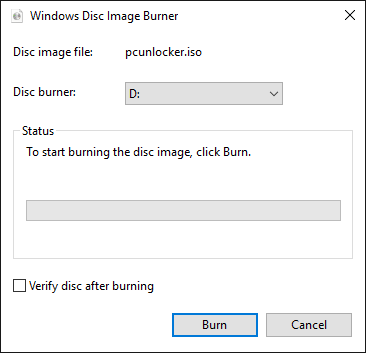 Just right-click on your ISO file in Windows Explorer, and then select “Burn disc image” from the context menu. When the Windows Disc Image Burner opens, just click on Burn and you’re done! What to do if the “Burn disc image” option is missing from the right-click menu? 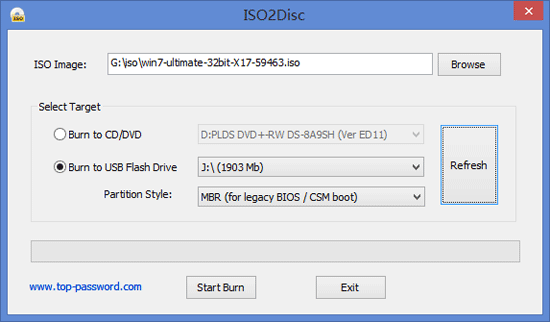 In this tutorial we’ll show you how to burn a ISO image to CD via command line in Windows 10/8/7. How to Burn ISO to CD via Command Line in Windows? Press the Windows key + R to open the Run window. Type cmd and press Enter. 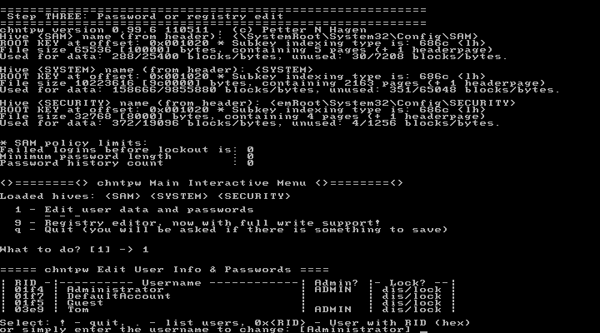 At the command line, type the following command and press Enter. 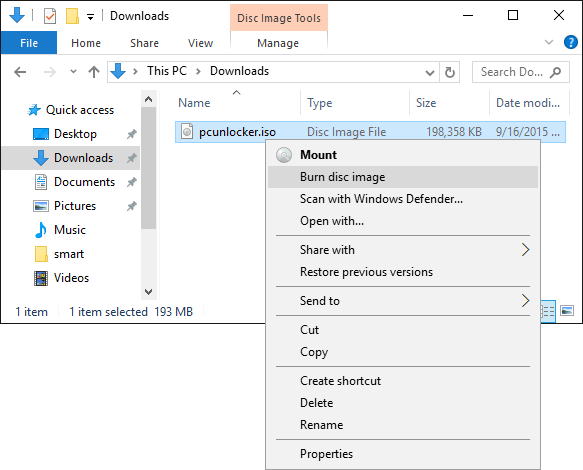 The Windows Disc Image Burner tool will launch. Select the drive with your blank CD. I also suggest checking “Verify disc after burning“. That will make sure there are no errors on the disc during the burning process. Click on Burn. Wait until the process is complete and you’ll have your ISO image burned on a CD. 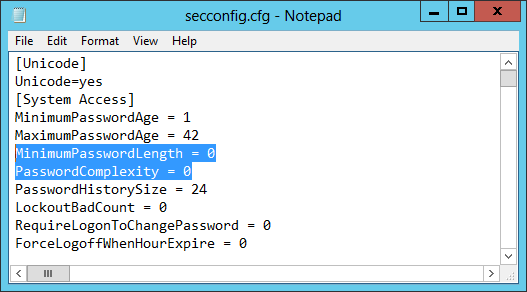 If your computer is a standalone server without Active Directory installed, follow the steps below and you can the disable password complexity requirements for Windows local accounts. While this will disable the password complexity policy for domain user accounts, if you perform the steps on a domain controller. Look for the line “PasswordComplexity = 1” and change it to “PasswordComplexity = 0“, also edit “MinimumPasswordLength = 7” to a lesser value if you like. At this point you can set a new less complex password! If you don’t have a Windows installation DVD or either it is damaged, then you can create a bootable USB drive to install Windows on your PC. These days the optical drives are becoming something of a rarity and most netbooks, tablets and small laptops don’t come with a CD-ROM. It’s also more convenient to carry around a tiny USB drive than optical media. As long as you have a copy of Windows 10/8/7/Vista ISO image, you can create a Windows installation USB drive in just a few steps. Here’s how. Download the freeware ISO2Disc on your computer and install it. Connect your USB drive that you want to use to install Windows and then run the ISO2Disc software. Click on Browse button to locate your Windows Installation ISO image. Choose the Burn to USB Flash Drive option. Select your USB drive from device list (if there are more than one connected USB devices). 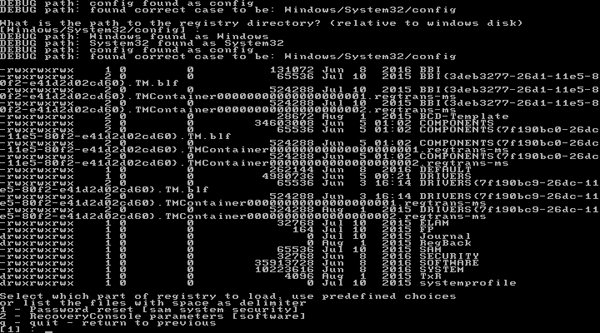 select the partition scheme as MBR(for Legacy BIOS/CSM boot), or GPT(required for UEFI boot). Click Start Burn and the drive will be formatted and the files copied over to the memory stick. After a few minutes your Windows bootable USB flash drive will be ready for installation. Reboot your PC and set the bootable flash drive as a first boot priority in the BIOS settings. Save the bios settings and reboot once again to continue with the Windows installation process. You must create a password reset disk before you forgot the password. A password reset disk can only reset the password of the account for which it was created. A password reset disk can only reset your password, instead of recovering your current password. You only need to create a password reset disk for your account once. No matter how many times you change your password. If you creates a second password reset disk for your account, the previous password reset disk automatically expires. 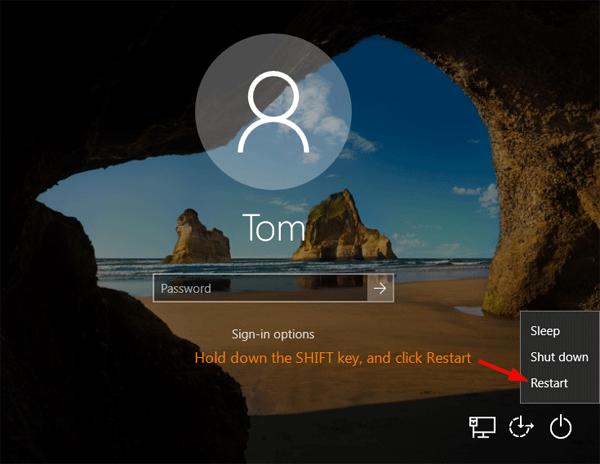 Here is how can you create a password reset disk in Windows 10. The same procedure also applies to Windows 8.1, Windows 8/7/Vista and XP. First of all, we need to open the Control Panel. Simply press the Windows key + X to bring up the Power User menu and then select Control Panel. 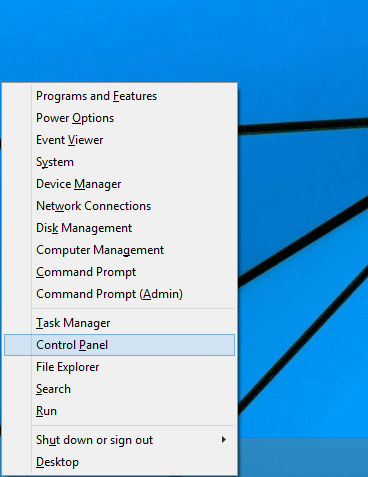 In Windows 7/Vista/XP, this can be done by clicking Start -> Settings -> Control Panel. 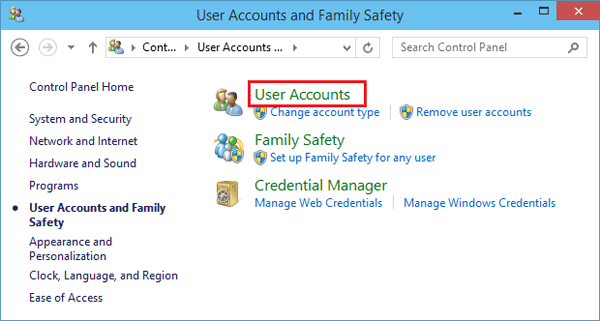 Under Control Panel, click on the User Accounts and Family Safety link. Now select User Accounts from the Control Panel. In the task pane on the left, click the Create a password reset disk link. When the Forgotten Password Wizard window appears, click Next. You will need a portable media before being able to create a password reset disk. 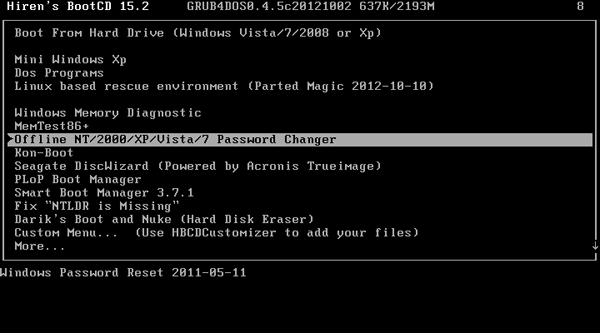 As the password reset disk only uses 2KB of space, you can use any size flash drive or an existing one if you wish. Choose the portable USB drive to create a password reset disk on. Click Next to continue. Enter the password for the account you are currently logged in with and then click Next. 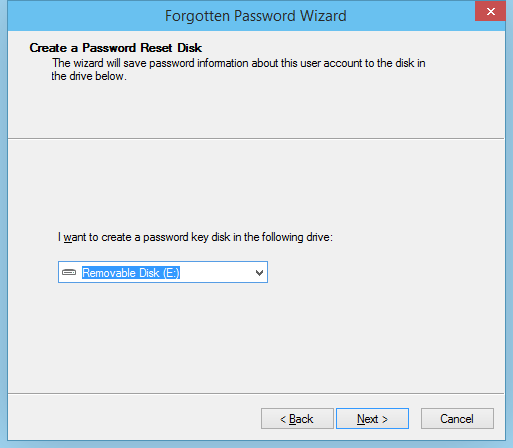 The Forgotten Password Wizard will now create an encrypted key (userkey.psw) and save it on the removable media that you selected. When it is done you will be presented with a screen that states that it is 100% complete. Click on the Finish to close the wizard. Please label the media as Password Reset Disk and then save it in a safe place in the event that you need it in future. It’s a good idea to create a password reset disk for yourself or for your elderly parents who tend to have bad memories on their password. If you ever forget and type in an incorrect password, Windows login screen will display an error message that says “The password is incorrect. Try again“. Press OK when that happens. You will return back to the login screen for that user account and you are now shown a link that says “Reset password”. Click on it, and the Password Reset Wizard will start. 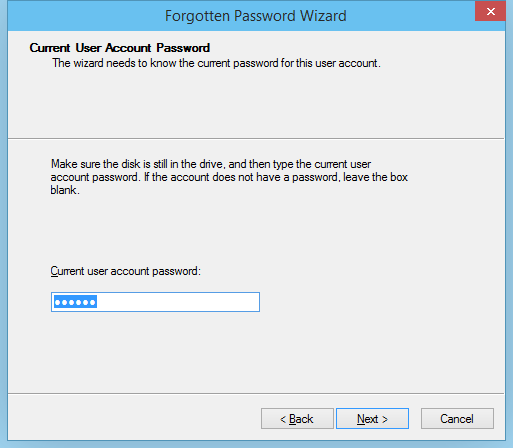 Insert your previously created password reset disk, the wizard will allow you to set a new password for your locked account. 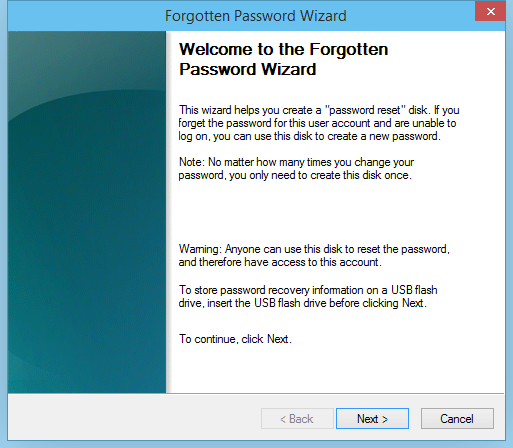 The easiest way to reset a forgotten Windows password is to use a previously created password reset disk. But most people, including me, don’t plan ahead for losing passwords. If you haven’t created such a reset disk, don’t worry! 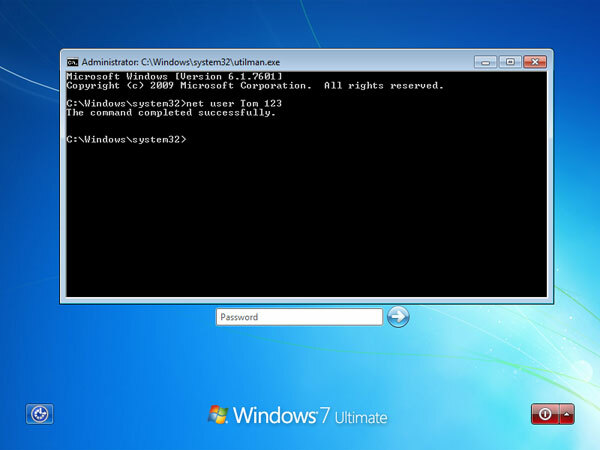 Here is a simple way to reset lost Windows 10, 8, 7 and Vista password with the Utilman.exe trick. 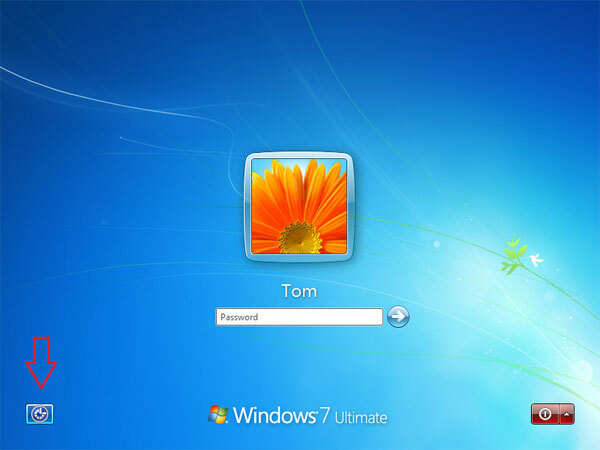 Windows displays an Ease of Access button at the bottom left corner of the login screen. When clicked, this button opens the Utilman.exe program, allowing you to start accessibility utilities. If you replace the Utilman.exe file with cmd.exe, you can then launch the Command Prompt from Windows login screen, and type the net user command to reset a forgotten user password easily! Boot your computer using your Windows installation disc. 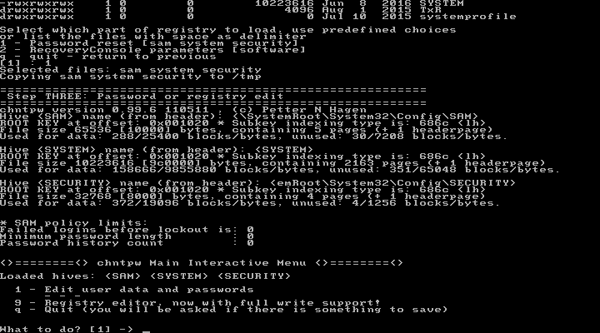 Once the message “Press any key to boot from CD…..” appears, press Enter to continue. When you get to the “Windows Setup” or “Install Windows” screen, press Shift + F10 key combination to launch the Command Prompt. 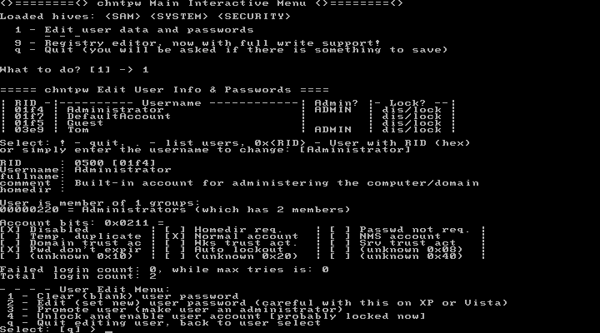 Type these commands, one by one, and press Enter after each. 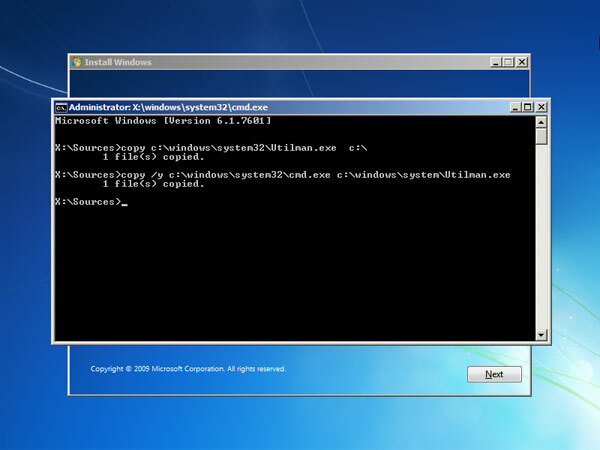 This will make a backup of Utilman.exe, and replace Ultilman.exe with cmd.exe. Now close the Command Prompt, and cancel the Windows Setup. Eject the installation disc and reboot your computer. There’s nothing to do here but wait for your computer to restart. When the Windows login screen appears, click on the Ease of Access button, a little icon on the bottom-left of your screen. Based on the commands that we used in the previous step, this will open a Command Prompt window instead of the Ease of Access menu. 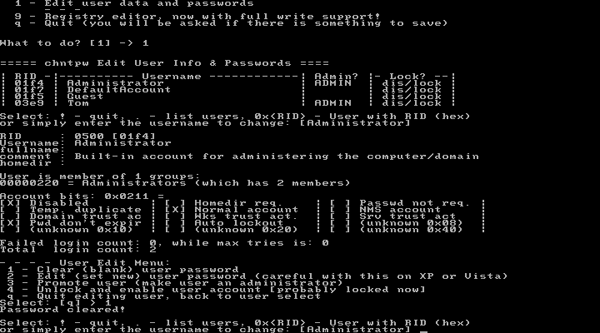 To reset an existing user password, we need type the command below. In this example, we will be changing Tom‘s password to “123“. Exit the Command Prompt. You should be able to log in with this new password straight away. That’s it – you have successfully reset your lost Windows password. Recently there seems to be a never ending stream of information leaks percolating through the news. Several states mandate wireless networks implement encryption and the Federal government is looking at forcing companies to disclose information leaks to affected customers. Of course any information leak or unauthorized access to sensitive data on a personal or even worse business network may present a myriad of liability issues. Wireless networks are often targeted and most of them are not up to the standard of security that is publicly available. Using no encryption leaves your network immediately open to attack. This means any third party can connect in to your network, discover resources like shared files or computers that are vulnerable and gain access. There is not much, if any legal protection afforded in this situation as the network is open. These attacks are simple to configure and can be implemented with off the shelf equipment, including many standard laptop configurations. Furthermore, WEP uses RC4 encryption, a weaker and older form of stream-based encryption that is easy for attackers to exploit because of its vulnerable key exchange mechanism and the lower grade cipher used. Many routers are setup to use WEP encryption, even those supplied by Internet providers. If you are using WEP (or no encryption at all) it’s best to consider using WPA2 with AES encryption. This is the highest publicly available wireless encryption standard. If your router or wireless card does not support this standard now would be a good time to consider upgrading. Forgot your administrator password? 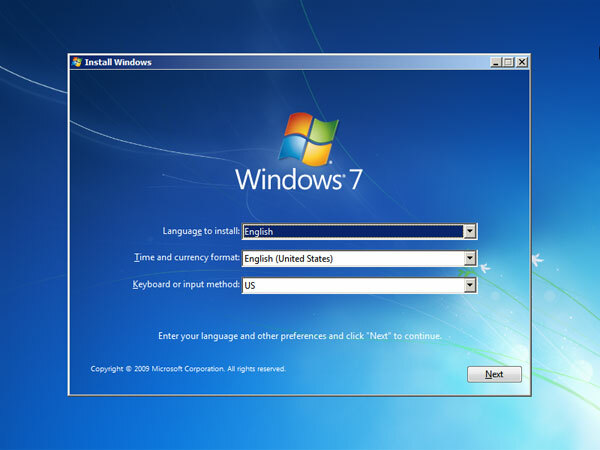 If you’re using Windows NT 4.0 or some version of Windows 2000, you can reset the administrator user account password by using a simple trick and hack that involves default screen saver, beside using third-party password recovery system or apps such as Login Recovery. With logon.scr password reset crack method, users can reset the admin user account password, without knowing or remembering existing password. But the trick won’t reveal and get back the existing password, nor it will work on newer Windows operating system such as Windows XP, Windows 2003 Server, or Windows Vista that has tighter security and privileges limitation. Logon or login to the Windows computer with any user account. Navigate to %systemroot%\System32 in Windows Explorer. %systemroot% is your Windows installation folder, and normally located in \WINNT or \Windows (i.e. \WINNT\System32). Save a copy of LOGON.SCR file, or simply rename the logon.scr file to something else. Just make sure that you remember where and what name is the backup copy. Delete the original LOGON.SCR from the %systemroot%\System32 sub-folder after you have backed it up. The file should no longer exist if you rename it. Note: If you having problem to delete or rename LOGON.SCR, it may be due to permission settings. Try to take ownership of the LOGON.SCR (by right clicking on LOGON.SCR, then select Properties and go to the Security tab, then click on the Ownership. Click “Take Ownership” and then click Yes to the prompt message. ), and give the Everyone group Full Control permissions (by right clicking on LOGON.SCR then select Properties, then go to Security tabs. Click on Add and browse to and add the Everyone group. Give Everyone Full Control and then click on OK.) You may need to install an alternate second copy of Windows on the machine to do so as detailed at the end of this article. Copy and paste the CMD.EXE located in %systemroot%\System32 to create additional copy of CMD.EXE in the same directory, then rename the new copied file as LOGON.SCR. This will let the Windows NT or Windows 2000 to use CMD.EXE command prompt program as the screen saver that will be activated after computer idle for specific minutes. Ensure that you activate the screen saver of the Windows. Wait for the computer screen saver activation idle wait time timeout, so that Windows will load the unprotected DOS command prompt in the context of the local system account as if it’s the screen saver. In the CMD command prompt that is opened, key in the following command to reset and change the administrator’s password: net user administrator newpassword And the user account for administrator will have the new password of newpassword (which you should change to your own password). With the syntax of net use user_name new_password, it can be used to reset or modify the password of other administrative user account’s passwords. You can now log on to the administrator account with the new password. You may want to replace back the original LOGON.SCR that has been backed up or renamed. You may want to delete the alternate installation of Windows, by deleting the installation folder or format the partition (if you install in different partition), and removing the second Windows entry in BOOT.INI file at the root. Use attrib -r -s -h c:\boot.ini to change and allow the boot.ini to be modified and viewed. Unless you’re using Windows NT 4.0 computers that were installed out-of-the-box that set the NT’s default permissions for Everyone to Full Control, you most likely will have problem to rename, change or delete the files located in \Winnt\System32 or \Windows\System32 folders if you log in as the non administrative regular user, as regular user cannot manipulate the files’ permissions. 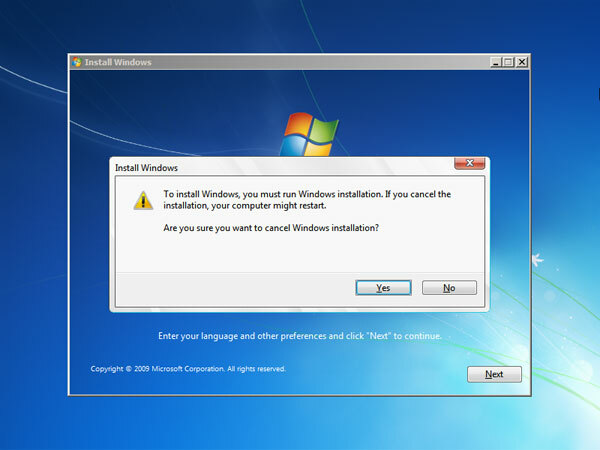 In this case, install an alternate second copy or Windows NT or Windows 2000 (make sure it’s the same version with the existing OS which you have forget the password installed), and the new install of Windows must be installed in different directory/folder from the existing Windows, which usually located in \WinNT or \Windows, or install the new Windows on another partition or drive. Alternatively, you can take out the hard drive (where you lost the admin password) and place or install it as a slave on another computer with any OS such as Windows XP or Windows 2000 installed. The purpose is to access the %systemroot%\System32 of the OS that you have lost or forgot the administrator password, and does the modification specified above. After installing the alternate copy of Windows, or install the hard disk as the slave disk to another Windows in a computer, boot up the system with the alternate Windows. If you install the second copy of Windows on the same machine, go to Control Panel -> System -> Startup (NT) or Control Panel -> System -> Advanced -> Startup and Recovery (W2K) and change the default boot instance back to your original instance of Windows. Then follow the step 2 to 4 above. After done, reboot and restart the system and bootup to the original instance of Windows (if you take up the hard disk to another machine, now put it back to the original computer), and continue the rest of steps from step 5 onwards.